Stacy Gooch Anderson's "Life Is Tough..."
Some people have compared Stacy Gooch Anderson's humor to Erma Bombeck's, but I beg to disagree. Stacy has a brand of humor all her own. 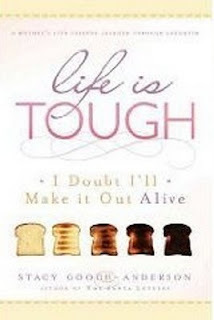 "Life is Tough: I Doubt I'll Make It Out Alive" is an entertaining, sometimes offbeat look at life lessons Stacy has learned, not only in growing up in her parents' family, but also through having children of her own. While I couldn't relate to every story because, for example, I've never been skiiing, nor have I ever tried to make my son wear red pants to school, but it tickled my funny bone to read about little Stacy paddling around a wading pool in mere inches of water, only to read further and discover that she's a teenager trying to keep cool! It also touched me to read about her father's death, because I've been there. This book is so full of a variety of situations that it would surprise me if there weren't something between its covers to connect with every reader. Shirley: Stacy, thanks for meeting me here in the kitchen at the crack of dawn. Wow, you look nice this morning. Is that your fail proof spackle beauty skin treatment straight from the pages of "Life is Tough?" Stacy: Nope, didn't have time for that. This morning I had bags under my eyes that Marry Poppins would've died for! I used a dab of wood filler over laid with a healthy skim of shellac to give my eyes a bit of 'sparkle'. You think it worked? Shirley: Indubitably! I've got to get me some of that. Any other beauty tips you can offer for early morning moms? Stacy: Don't get up if you don't have too. Sleep is a woman's best friend,.....that and mascara. Everyone looks like a sun deprived albino without plump, dark lashes. Just ask Maybelline! They spend millions on plumping our lashes! Now if they could only find the cure to de-plump our thighs and backsides, their CEO would beat Bill Gates and Warren Buffet combined in terms of personal networth. Shirley: Amen! You're awfully good with that spatula. Looks like you've done this breakfast routine before. Your moves from fridge to stove are worthy of an Olympic Medal. Stacy: Thanks. 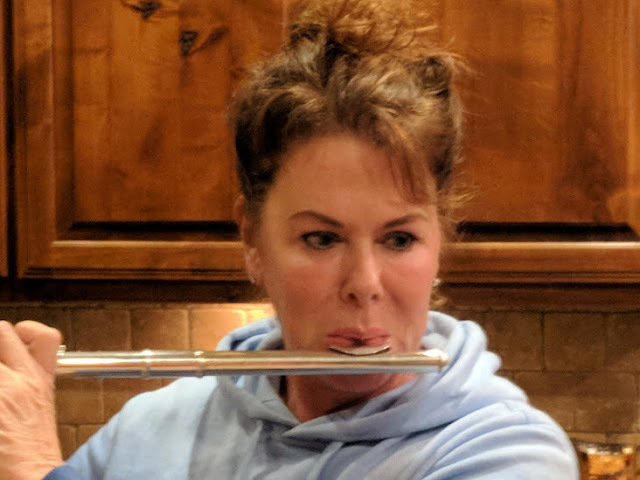 I get a lot of practice. I have four sons who, if they gave up just one meal a day, could solve the famine problems in Africa. Trying to keep them and their friends full is definitely a full time job. When I need a break, I have to send them to the frozen food isle at Costco for a snack. But since I'm at it, I'll make breakfast for you too, if you like. Shirley: That would be great! Stacy: (Squints at me since the shellac is flaking a bit around the edges where her laugh lines are stronger than her home made beauty regiment) You look like an over-easy egg eater. Shirley: How did you know? I like wheat toast, too, please. Shirley: Well, okay, then. It seems like you've already experienced a lot in your life. Is there something you haven't done yet that you'd like to? Stacy: Get through it - life, that is. Just kidding. It's a pretty sure bet that I won't make it out alive but before I'm consigned to lying supine in a pine box for the better part of a century, there is a LOT I want to accomplish - if only God will give me the strength, the courage and the thinner thighs to do so. Shirley: Now that you have two books published, are you planning a third? Stacy: I'm working on a companion book to "The Santa Letters" called "The Inmate Letters." I also have various other projects in the works. But my next book comes out this fall. It's a Christmas storybook called "The Legend of the Star." Shirley: Sounds great! Uh... what's that smell? Ack! I said wheat toast, not black bread! Stacy: Oh, Shirl, just look at it as slightly better tanned toast. Why,....with a slathering of butter and home made blackberry jam, you won't even notice that you're biting into a slab of charcoal! Shirley: Listen... I hear the sound of many hungry feet on the stairs. Well, not hungry feet, but I'm sure the hungry owners of those feet need that toast more than I do. You can go ahead and give it to them, okay? Shirley: Have a great day! Happy mothering. We leave today for the Storymaker Conference at the Provo Courtyard Marriott. I look forward to being on a non-fiction panel of authors. I won't be posting again until I get back. Marsha Ward's "Trail of Storms"
Trail of Storms delivers a powerful saga that doesn't water down the hardships of life in the untamed west. It covers a wide scope of feelings from drama to adventure to romance. Marsha Ward's skill as a writer makes the reader's skin crawl at the abduction and violation of a young woman, her family's ultimate flight from their home, and trek across unknown wilderness. Ward makes her characters come alive with different personalities and ways of dealing with life, but when the odds stack against them, they pull even closer together to make it through. Ward's endings are always satisfying, not always what you expect, but the way you instinctively know things ought to be. Shirley: Marsha, you look good in that cowboy hat. Do you have one for me? Or should we be wearing bonnets? Marsha: I have some bonnets that a good friend of mine made. She's also a writer of Westerns, named C. K. Crigger. But yes, I did bring you this “John Wayne” style hat. I hope you like it. Bonnets can be a bit restricting at times, like when you want to look left or right. To see anything, you have to turn your whole head. Hats don't make you do that. Shirley: Looks like it's time to hit the trail for Arizona . How did you find out about this old time vacation plan anyway? Marsha: Dude ranches used to be very popular, before time-shares came along. We're going to one near Wickenburg. It'll give us that old time Western experience, something like in the movie "City Slickers." Shirley: Oops - look out for that cow pie. Nice side-step there! You ought to join the square dancers. This is your third novel in the series. When you wrote your first one, did you know there would be three? Marsha: No. I began what became my first novel, The Man from Shenandoah, in 1965. At the time, my goal was to write “The Great American Novel.” Soon I had a “novel” of twenty chapters that I carted around with me for years, but I didn't seriously work on it again until the 1980s. After learning what commercial writing really entailed, I realized that I had a nice summary. I began to hone my natural talent and bit by bit, after throwing away a lot of chaff—such as too many characters—and adding the good stuff—like sensory details and emotions and actual plot—I had something to send out. That I did. I was getting good remarks from editors (but no offers yet), when I had a health crisis in 2002. It looked pretty bad. I wanted to leave my work behind in fixed form so no one would throw it out upon my death, so I looked into self-publishing. After some intensive study and thinking about what form of self-publishing I wanted to engage in, I chose to go with iUniverse. After a terrible false start on the cover, I provided them with a photo to use. I was so delighted with the quick turn-around and then the great response from readers, that I decided to use the same method of publishing for the follow-up novel, Ride to Raton. When word leaked out that my third novel, Trail of Storms, was finished at last, I was encouraged to submit it to a couple of publishers. I knew it wasn't right for them, but did so. I regretted wasting those eight months until rejection when a reader came up to me in a grocery store and begged for the new book. Why delay what clearly had a market? I went back to iUniverse for a third go-around. Shirley: How did the idea of this series come to you? Marsha: The first book ended happily for one brother in the large Owen family, but I wondered, “What about the brother who lost the heroine's heart? What happened to him?” The answer came to me one day in the shower. Naturally that required another book. Then, due to the bittersweet ending of the second, a third was indicated. Although this third one completes a story arc, I'm sure there will be more books about the Owen family. Shirley: Cactus alert! Boy, is that stuff ever habit forming. Not only did my husband sit on cactus twice, but my teenage son has already done it once! Runs in the family. What have you got in the writing pipeline next? Marsha: Actually, not an Owen family book. It's set in 1893, and it's a bit of a Western mystery, starting with a threatening telegram to a New York City debutante who has fallen on hard times. Shirley: That sounds fabulous! Keep those fingers tapping on those keys! I want to take a look-see at that new story of your'n. Well, looky there, the sun's getting lower in the sky. Time to stop for some rattlesnake stew and biscuits to eat while the coyotes howl. Is there anything else you'd like to tell the cowpokes on life's trail who enjoy a book by the campfire now and then? Marsha: Sure! If you think all Westerns are about outlaws and lawmen, or cowhands and sheep-herders, guess again. The Western genre has grown and evolved into many sub-genres, including my action/adventure/sweet romance works dealing with Western Migration and post-Civil War angst. Tom Sellack once said there should be a shelf in bookstores labeled "Darn Good Reads." I like to think my novels go there. Give them a try. 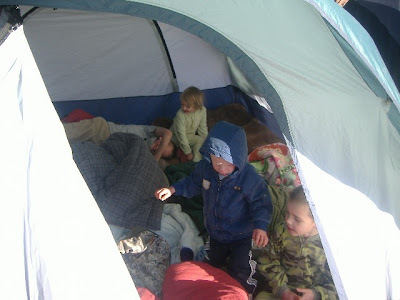 Shirley: Well, you get the bedroll and I'll take the down-filled below-zero rated sleeping bag. No, this was your idea, you get the bedroll. It's more authentic, just like your writing. Marsha: That's fair. Thanks for the compliments. 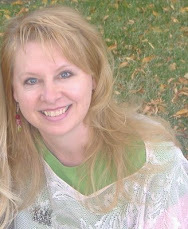 BE SURE to check out Marsha Ward's website BY CLICKING ON THIS LINE! MARSHA'S BLOGSPOT IS RIGHT HERE! OO, OO, CLICK ME, CLICK ME! A partially eaten bag of potato chips can be perfectly harmless, unless a hungry dieter dips her hand in for "just one." Well, just one in a bag that's already been picked over will most likely be broken, so it doesn't count. Then you eat just two, then a few more partial chips, and then you get down to crumbs, and how bad can a few potato chip crumbs be? Happy tongue, grumpy waistline. My hair is extremely resistant to curling. Extremely. It has to be layered in hairspray and held prisoner in curlers at least overnight for it to conform to curls in the morning before making a break for straight at night. But one day I wanted curly hair, so with a clear evening, I rolled the resistant locks in my pink bendy-tube curlers. THEN I got a phone call "Shirley, we're having our choir dessert night." DESSERT? Well, I had to have some sweet to counterbalance the chips. So I went, curlers and all. My friend, Sarah, came in her pajama bottoms, but she said I had her beat with the curlers. THEN my 9-year-old wanted to go to the store for apple juice. I thought of a couple of other things I needed, too, so there was nothing for it but to go into the store. I wrapped my head in a scarf and trotted on in to get my grub. When we came out, I was feeling pleased that no one had mentioned my lumpy head. So I said to Michael, "Does this scarf look okay?" He tilted his head up at me, took a somber look, and said, "It looks like you have diabetes." Hey, my five oldest sons are now Eagles! Zack (far left) and Brian (second from right) joined brothers Andy (second from left) and Jeff (far right) in the Eagle's Nest on Sunday! 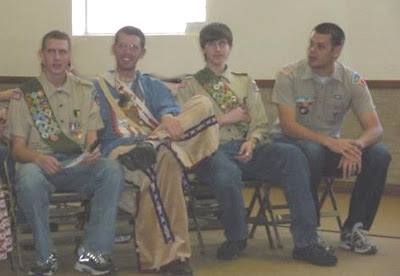 Big brother Scott is an Eagle Scout too, but couldn't make it to the festivities. Four Busy Grandkids at Grammy's house! Wow, four grandchildren have come to visit this weekend! (I have five, but Landon is not walking yet and is with his mom.) What fun! What thrills, spills, and wills! They make me feel young and old at the same time, if that makes any sense. Hey, I blogged on Monkey's site, so go read about the adventures of Junior Genius by clicking here! When my nine-year-old Michael asked me to write a note for him, I was a little distracted. "Mom, please write 'You Stink Idiot'," he said. I started scribbling as quickly as I could, "YOU STINK..." Then I stopped and looked at Michael. "What was the last part?" I asked. He stared at the paper for a moment. "Mom, why did you write that?" he asked. "No, I said, 'Please write use sink'." "Yeah, the one upstairs that Dad fixed. I want people to know they can use the sink." "Then what was the last part?" I asked. Patiently, he repeated, "Use sink. It's fixed." "OH!" I cried, laughing. "I thought you said something else." He regarded me with his solemn green eyes, then said slowly, "I'll get you another piece of paper."